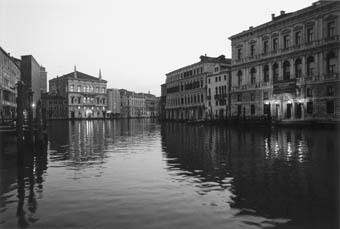 It's seven o'clock in the morning, Venice is getting ready for the day. The camera glides over the dark waters in which the golden light of sunrise is broken by the ripples. A cargo boat ferries the camera between the Giudecca and the Zattere into the still undisturbed city. The camera captures without pause, which is to say with few edits, the everyday face of Venice: casually and yet still coloured by the things which have always typified life here in the city. The film is a gentle glide over bridges, past canals and through alleys which open out onto squares, only to dive back into the narrow passageways and the city's labyrinth. On this visually exciting journey the camera, in the style of cinema direct, constantly encounters the people living in Venice, giving us a personal insight into their lives. Wolfgang Ettlich was born in Berlin in 1947 and studied Political Science and Communications in Munich, followed by work as a freelance documentary filmmaker for the Bavarian Broadcasting Company. He founded his own production company in 1985 with a special interest and emphasis on long-term projects. A selection of his films includes: Irgendwie Power machen (1987), Ausgerechnet Bananen - Ein deutsch-deutsches Wirtschaftswunder (1991), Schoener als Fliegen - Geschichten aus dem Erdinger Moos (1992), Die Schuetzes-Helden zwischen Bananen und Kohl (1994), Irgendwie Power machen - 15 Jahre aus dem Leben des Oliver N. (1994), Kapitalismus macht Spass - Berlin Friedrichstrasse (1996), Yesterday Is Today (Gestern ist heute, 1996), Soenke Wortmann (1996), We\'ll Be Keeping On (Wir machen weiter, 1999), Venice - Like a Dream (Venedig - Als haetten wir getraeumt, 2000), Im Osten geht die Sonne auf (2001), Der Fussballtempel (2005), and Do Engines Have a Soul? (Hat der Motor eine Seele?, 2008, in co-direction with Andreas Dirr).